The history of the County Infirmary dates from April 1858, when the first vote was taken to build a home for the unfortunate poor people of the county. The proposition was defeated by a large majority. However a few years later, the county commissioners took steps toward purchasing a convenient location for a so-called "Poor Farm". The first site selected was 160 acres of land about 2 1/2 miles northeast of Kenton, owned by John Parkinson. The farm was purchased, but nothing was done toward improving it, nor was it ever occupied for the purpose intended. In the fall of 1868, B.R. Brunson and David Snodgrass, two of the county commissioners, concluded that the Parkinson Farm was not a suitable place for an infirmary, and against the protest of Samuel Wood, the other member of the Board, voted to change the location. They selected a site west of Kenton on the Lima Road. 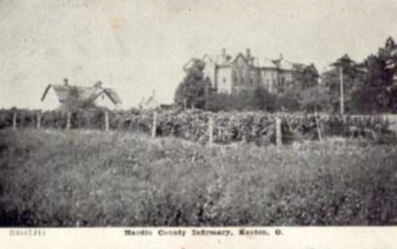 The present county home farm was purchased for $5,000.00 An infirmary was erected on this site and was opened for inmates on January 5, 1871. The auditor's report for the year of 1869 stated that the farm and buildings cost $46,000.00. The present county home was voted on by the voters at the November 1953 general election for a bond issue of $600,000.00 to run for 20 years. The bond issue passed by a vote of 5,112 to 3,461. The present county home was ready for occupancy in 1957. Hardin County Home was built in 1955, with quite a bit of remodeling done between 1976-1977. More remodeling was done in 2000. The Board of Education moved into the lower level and all residents were moved to the upper level. Then in 2002 the chapel was transformed into 2 new suites with restrooms and the front entrance received a face lift. The Home must operate according to ODH rules, regulations and nursing home laws. It is subject to an annual state survey. Nursing Assistants employed must be state-approved with the Ohio Department of Health Long Term Care Nurseaide program. Hardin County Home is independent of the County General Fund. We are self-supporting through medicaid, medicare and private pay residents. 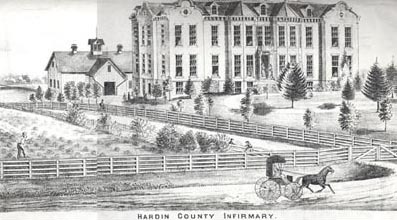 In 1997 the name was changed from Hardin County Home to Hardin Hills Health Center to keep up with the times and to forget the old ways of the poor farm. We are now considered a Long Term Care Facility.